It’s true that Alex Song has a tendency for the indiscipline – which might boil down to his excitable character – and last season, he did abandon some of his tactical duties. But it seems he has attracted an unfair proportion of the blame for the goals Arsenal conceded. Indeed, there’s this growing idea that Arsenal must play – or rather be better – with a sole holding player. Perhaps, but the growing demands on technique and fitness means increasingly, it should be about the team. And certainly, one can make an argument against the team’s shape for Song’s diminishing defensive statistics (and their goals allowed column). Because last season, Song simply had to do more for the team than he had in previous seasons. In 2009/10, he was the deepest midfielder, breaking down attacks and moving it along to one of the midfielders in front of him when he won it. In 2010/11, he shared the role with Jack Wilshere and as such was allowed to get forward intermittently, contributing with four goals. But even though Arsenal conceded more goals in that campaign than in the previous one, structurally it’s probably when they were at their most impressive (and the implosion in the last quarter made it look worse than it was). 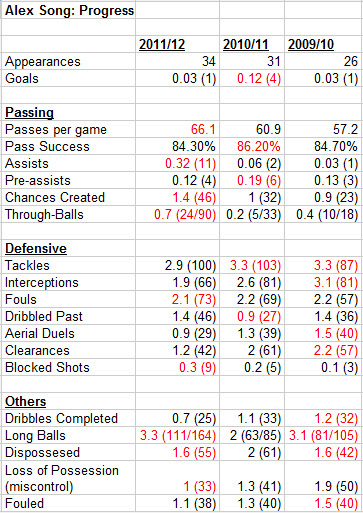 Last season, though, Song had no Wilshere and the dynamics of the double pivot changed. Arteta and Song shared roles without either player taking full responsibility so Song pushed up to do what Wilshere usually did; give impetus with his running and to dink passes – to more success – over the defence. And what’s more, Song was required higher up the pitch because for large chunks of the season, Arsenal lacked full-backs and as such it meant creativity was almost always central. The problem of creativity was further compounded by Wenger’s prolonged experimentation with a three-striker system up top (which continued to be a problem in their first fixture this season against Sunderland). In 2010/11, remember that Arsenal had Nasri to share the burden to create from out wide even if Cesc Fabregas did tend to monopolise creativity. Defensively, the relaxed pressing last season also made it easier for teams to turn Arsenal from back to front and as such, easier to get at the backline. Nevertheless, it’s probably best not to look back but look forward instead to this season and with the departure of Song, it especially elevates the stature within the team of Arteta. If anything, he is now Arsenal’s ideologue – bright, opinionated (at Everton, he was known for having tactical discussions with the manager, David Moyes) and technical – he represents Arsene Wenger’s trust in brains over brawn. Wenger described Arteta last season as a “real midfielder – that means he can defend and he can attack” and against Sunderland showed why the manager places so much faith in him. Arteta made 4 tackles and 4 interceptions as well as making over 100 passes but what was most impressive was the intensity of which he covered ground. A couple of times he filled in for his centre-back and even got into the position when tracking back which I like to call the “third centre-back”. [image lost] Via @1DavidWall: Arteta (8) played the deepest of Arsenal’s three starting central midfielders, with Cazorla (19) pulling the strings. On the training ground, Arsenal have been working very hard on holding their shape and keeping/moving the ball better and that, Wenger sees, is the remedy to both their attack and defence. Because it’s as Athletic Bilboa coach, Marcelo Bielsa, says; “attacking football has nuances” and it’s controlling and understanding those nuances – how to dictate tempo and the dangers to expect when you lose it – which will make Arsenal better. The two players who have submitted to this creed the most – talking extensively about team shape in interviews – are the team’s two leaders: Thomas Vermaelen and Arteta. (Robin van Persie similarly believed in moving as a team and led by example through his running to get back into position when the team defends, acting as the reference point, but perhaps it’s more effective to organise team-mates from their positions than higher up). Similarly, the pressure is also high on Steve Bould (and Neil Banfield too for that matter) to make a robust impression in his first season as assistant coach and he showed – as early as the eleventh minute against Sunderland- he can make big decisions. Bould noticed that twice, Sunderland had opportunities to score from attacks originating from fast breaks down the channels so after Jack Colback stole ground in the midfield to shoot, he instructed the full-backs to be more aware whenever they get forward. Thereafter, The Black Cats mounted no serious threat and of the 84 teams that played in the Football League and Premier League in the first weekend, they were the only side not to win a corner. Post Song, the methods of Arsenal may initially seem unclear. But what it does do is force Arsenal is to place even greater trust in their identity. And what bigger test is there of that than the one which they face next; away to Stoke City. *Note: For all intents and purposes (whatever that means), match reports will now be published for my new column on Arseblog (with thoughts if I care enough about you guys, on here). 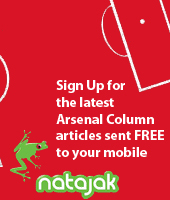 My latest piece can be accessed here on Arsenal’s shift away from the “three strikers” tactic used last season. Editorials will still feature on this blog. Thanks for reading.